This lovely wildflower is rare wherever it occurs. 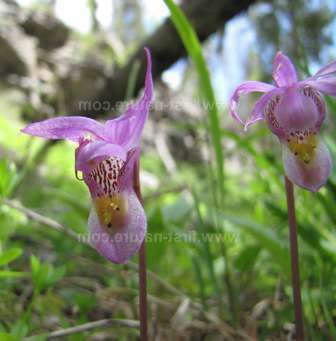 It is one of the most sought-after 'finds' for anybody who is interested in wild orchids. In America's high mountain regions this orchid waits for the snow to melt and then flowers in moist cool forests where there is plenty of humus beneath the trees. It grows high up in the mountains in the montane and subalpine zones in most northerly states, including west and central Montana, Colorado and California. The worldwide distribution of Calypso bulbosa is circumpolar: apart from America it occurs also in Canada, Scandinavia, Finland, Russia, Mongolia and Japan. Despite being widespread its continued existence is perilous. The plants live for a maximum of five years and they are easily destroyed by disturbance to their habitat. They cannot be transferred because they depend on a relationship with fungi in the soil in order to germinate and grow. These unique conditions can never be recreated in gardens. 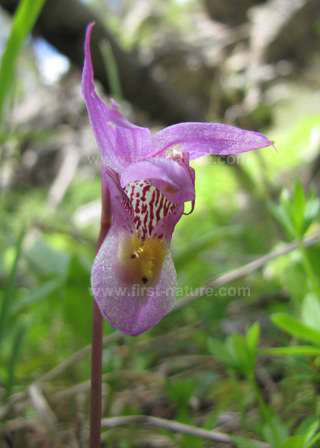 General destruction of the forests by logging (particularly in California) where Calypso bulbosa lives is only a small part of the problems which face this plant. It also suffers human predation by orchid hunters, who dig up the plants in order to try and cultivate them. In common with many other rare and beautiful wild orchids this endeavour nearly always fails, and so we lose many more plants than we gain. Calypso Bulbosa flowers at lower elevations from June, but at higher altitudes it can still be found blooming well into July.